Justin Drew Bieber is a Canadian pop/R&B singer-songwriter and actor. Bieber was discovered in 2008 by Scooter Braun, who happened to come across Bieber’s videos on YouTube and later became his manager. Bieber has been nominated and awarded numerous accolades over the past few years, winning Artist of the Year at the 2010 American Music Awards, and being nominated for Best New Artist and Best Pop Vocal Album at the 53rd Grammy Awards, among others. Bieber is considered a teen idol, and has been subject to acclaim from fans, as well as criticism and controversy from matters concerning his popularity and image. Justin Bieber is everywhere you turn these days, it’s Bieber Fever! So when he popped up on Holiday in Hawaii last month without his shirt on we noticed he was sporting some new ink on his ribcage. 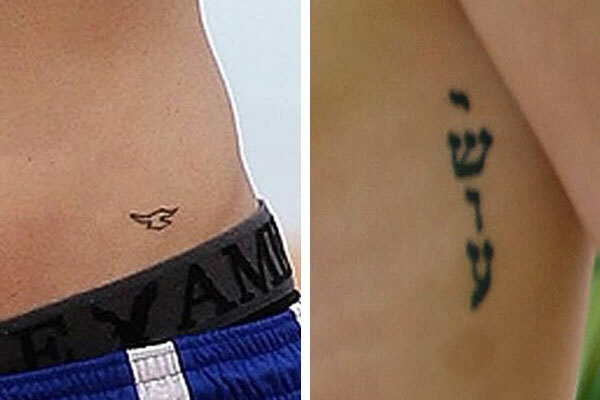 Justin already had one tattoo on his left hip of a seagull. He got it when as a 16th birthday present and it seems to be a sort of family tradition as both his father and uncle have the same tattoo. The meaning behind Justin Bieber’s bird tattoo is from the Jonathan Livingston Seagull book. It is about a seagull learning how to fly and learning about life in the process and the cover features the outline of a bird in flight. It was first published in 1970 and quickly became an American favorite. In just two years over a million copies were in print. It remained on the New York Times Bestseller List for 38 weeks, and is still a popular book today. Justin’s has a tattoo on his left ribcage and it was inked shortly after he returned from a trip to Israel which was said to be his inspiration. The tattoo is written vertically in Hebrew and reads, Yeshua which in English translates to Jesus. 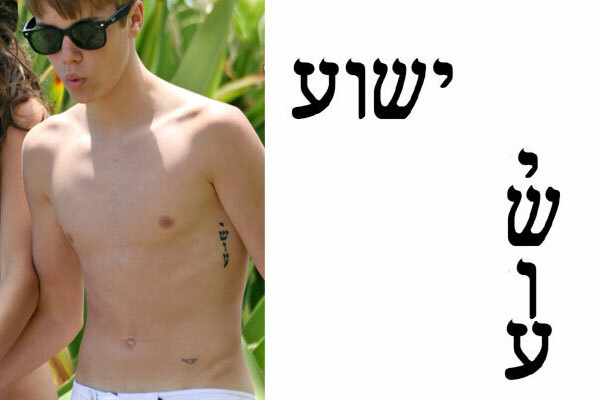 In the above picture the we compare how Yeshua is originally written horizontally, and Bieber’s adaptation vertically. 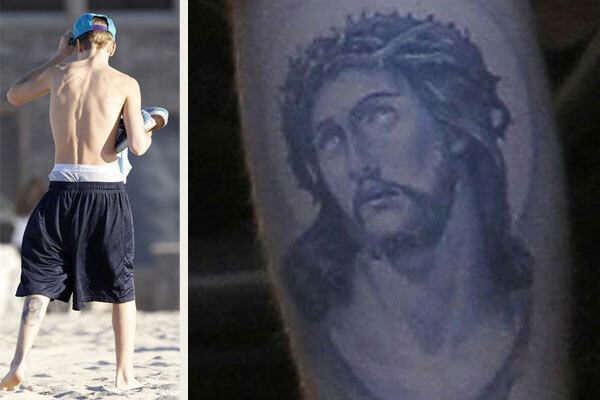 Justin recently added to his body art collection by tattooing the image of Jesus Christ on his left calf. This is his second tattoo dedicated to his faith. What do you think of Justin’s tattoo’s?